My wife is diligent about giving our boys different experiences to fill their childhood. She is especially skilled at sniffing out free events. Unfortunately, we are often a step behind on the details when we set about our adventures. We might arrive at the wrong time or pull up to an abandoned building with an address almost like the one where all the wonderful childhood memories are being handed out. Our eldest son likes the old Batman TV show and our younger boy enjoys singing the theme song. When we learned that Adam West was due to make two appearances at our university, we immediately marked the date on our calendar. We explained to our four-year-old that this was the actor who played Batman; he wouldn’t be in costume and he would be older than he looked on TV. Even so, the boy was excited to see him. The little boy didn’t care who it was. He’d sing his song for Burt Ward if he had to. I had to work, but my wife got the boys to the student union in time for the afternoon autograph session. This great success was marred only by the fact that the event was happening elsewhere. When this troubling detail was discovered, it was too late to make it in time. We’d have to try for the later event. We made sure that the evening appearance was indeed located at the student union before setting out. The big boy brought his Batman mask and cape from two Halloweens ago. In the car, the little boy spontaneously burst into his rendition of the Batman theme song. We imagined the great photo we would get of our young Batman with the original Caped Crusader. We thought about how tickled Mr. West would be to hear a song so near and dear to him from the mouth of a babe. He might even tell the story in future interviews. Maybe he would recount it in a memoir. At the union, there were rows of chairs set out before a stage. It looked like Mr. West wanted to give a talk before signing autographs. We found seats and immediately swung into keep the toddler contented mode. From what I heard, before the toddler bolted from the room, Adam West sounds like a funny, humble man. I spent the last half playing out in the hall. At last, people started streaming out. It was odd that they didn’t stay for autographs. We went back into the room to find my wife and the big boy among the few people left. Not among them was Adam West. Apparently, the earlier event had been the only autograph session. Details! It wasn’t a total loss though. 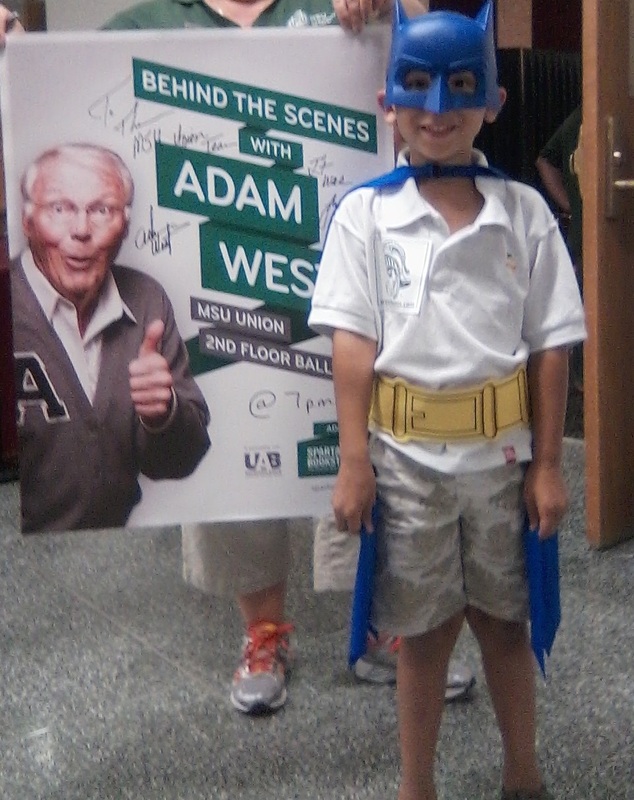 The little boy had a great time playing in the hall; my wife learned several fun facts about the career of Adam West; and the big boy got an awesome photograph of himself with a poster of the senior citizen who once was Batman. Not too shabby. He’ll always remember the day he posed for a picture with a lady holding a poster of a guy in prop sweater. This entry was posted in Outings and (Mis)Adventures and tagged Adam West, children, Dads, family, fatherhood, humor, kids, parenting, Sons, television. That is too funny. If nothing else, at least it was a memorable family outing. You hit it on the head with “if nothing else”. Isn’t that the dude who plays the mayor on Family Guy? I suppose it is, but we don’t own any Stewie costumes. Thank you very much for considering this blog. I do appreciate it. I’m pretty not good at passing these things on, partly because I’m too lazy to do all the work, and partly because I’ve already blessed most blogs I read with them. People are starting to think I love them just a little too much. In spite of my lazy ingratitude, it really does make me feel good to know that a few folks do enjoy this stuff enough to nominate it. Thank you. For some reason, you seem to be under the impression that “best” is a synonym for “most confused”. If he remembers this long enough to gripe about it, he really does need therapy. Our family needs a personal assistant. Too funny. Do you suppose in 30 years the same thing will happen to our grand kids with Ben Affleck? Not if there is a merciful God. Holy Awesome Story Batman! The best memories are always the ones that didn’t go the way you planned. They make good blog posts, but not such great childhood photos. Just make sure to print out the blog post and tape the picture to it, so he will one day know the awesome story behind the crappy photo 🙂 I have said that blogging has made me see parenting differently. Now when things go wrong, I can at least get a good blog post out of it. Did Batman pick up an honorary Doctorate? Dr. Batman has some gravitas. I think he just dropped by for a couple of frat parties.